The Utah Native Plant Society is dedicated to the appreciation, preservation, conservation and responsible use of the native plant and plant communities found in the state of Utah and the Intermountain West. Our goal is to foster public recognition of the spectacularly diverse flora of the state--a natural treasure to be valued, respected and protected. In 2018, we celebrated our 40th year. 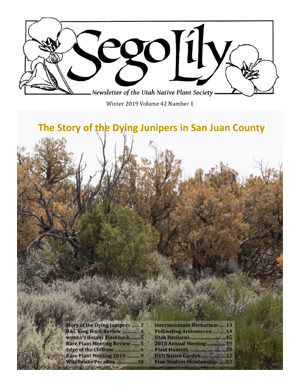 See the 40th Anniversary Issue of the Sego Lily newsletter. Native plants are plants naturally found in nature. These natural plants have adapted to an amazing array of habitats and microclimates, achieving a balance with other living things and forming the foundation for all life. A serious threat however to our native ecosystems is a growing list of plants that do not belong in our natural landscapes. 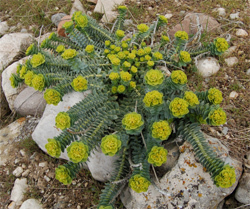 Along the Wasatch Front, one of the most significant of these threats is from the unfortunate and widespread introduction of Euphorbia myrsinites (Myrtle Spurge aka Donkey Tail Spurge and as Blue Spurge). We all must now take responsibility for trying to remove this terribly invasive plant (see video link below - proper precautions are required). Included in the definition of native plants are both vascular (wildflowers such as the Sego Lily or a sunflower, but also ferns, underappreciated native grasses such as Indian ricegrass, and trees like Fremont Cottonwood or Blue Spruce, for example) and non-vascular (critically important groups like mosses and lichens) plants. So the phrase "Utah native plants" includes Utah wildflowers, but also much more. Looking for one of our posters? Utah's state flower and the inspiration for the UNPS logo and newsletter. Learn more. For background, see article on page 4 in the Winter 2016 Sego Lily.